The Luzern Passion Play ("Osterspiel") is one of the best documented medieval theatre performances, as both 15th-century manuscripts of the text and a graphic plan of the 1583 performances survive. The plan shows how the stage and various stage set items were arranged on the wine market square in Luzern. Since the square has hardly changed since 1583, it is quite easy to imagine how the performances looked like. Only the upper half of the square was used for the play, with one street left open for processional entrances. Scaffolds surrounded the square all around, representing various places as the passion story unfolded. Spectators followed the performance from stands ereceted behind the scaffolds, and from windows and roofs of the surrounding houses. 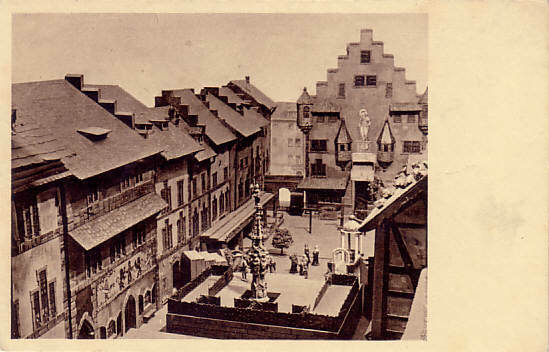 Reverse Text: "Theater-Museum, München - Das Osterspiel auf dem Weinmarkt in Luzern 1583 (Modell)"